Shania Twain Band performs "Love Gets Me Every Time"
"Love Gets Me Every Time" is a song by Canadian singer-songwriter Shania Twain. It was written by Twain along with her then husband Robert John "Mutt" Lange, and produced by Lange. It was released on September 23, 1997 by Mercury Records Nashville as the lead single from Twain's third studio album Come On Over (1997). It was chosen as such following weeks of careful deliberation and constant reconsidering. Originally titled "'Gol Darn Gone and Done It", the song's title was altered because of its difficulty to pronounce. The song regards falling in love despite numerous attempts to evade it. It is an uptempo number that prominently features fiddle. Critics favored "Love Gets Me Every Time"'s immaculate production. The song became a success in country radio. It topped Billboard's Hot Country Songs chart for five consecutive weeks, Twain's fifth and longest reign on the chart. It was certified gold by the Recording Industry Association of America (RIAA) for shipments of over 500,000 copies in the United States. 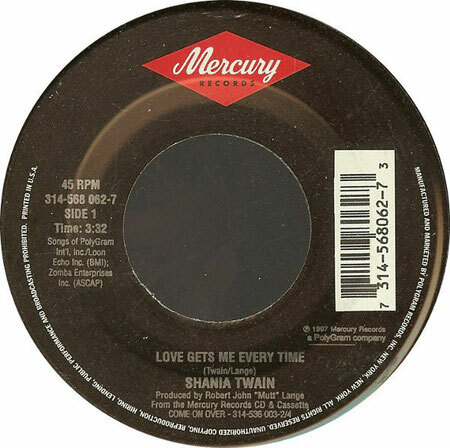 "Love Gets Me Every Time" was also her seventh number-one country hit in Canada. Its music video was directed by photographer Timothy White during the photo shoot for Come On Over's album art. It features Twain in various performance scenes, along with behind-the-scenes shots. Furthermore, the song has become a staple on Twain's set lists, as it was performed live on the Come On Over Tour (1998–99) and Up! Tour (2003–04).